Asbestos removal in PA must be handled carefully and that’s why AAA Lead Professionals are here serving eastern Pennsylvania for years. The primary reason is the risk of exposure, which can be medically devastating. That’s why the firm you hire for asbestos abatement is so important. What some people fail to realize is that there are actually two types of asbestos – Friable and Non-Friable – and you may find one or both of them in your home or commercial building. Experienced asbestos abatement specialists have the tools and knowledge to ensure that your asbestos removal and extraction is handled professionally. So to start, let’s look at the differences in these two types of asbestos. Friable asbestos is the type that can be disturbed easily and become airborne. At that point, it can be absorbed into the body where a host of ailments begin such as chest cavity thickening that impairs your lungs (pleural plaques), lung scar tissue (asbestosis), mesothelioma and lung cancer. Non-friable asbestos is just as dangerous because they can create the same medical issues although it is bonded with another material and does not get disturbed as easily. The danger arises when these materials are cut. They’re often found in items like flooring, shingles, siding and roofing. Before any type of removal though, asbestos inspections are necessary and must be performed by experienced asbestos technicians like AAA Lead Pros. 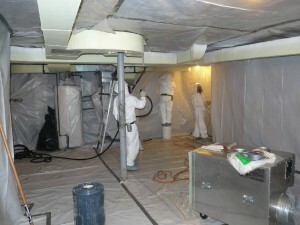 It’s important to note that not all asbestos abatement contractors are alike. With AAA Lead Professionals, your asbestos removal/abatement will be simplified, we will explain the process and advise you on the best and most efficient methods to perform the abatement. Also you will find competitive pricing provided by a team with years of experience. Plus, no customer is too big or too small for our technicians. So, when you need quality asbestos removal in PA, call or e-mail us today for a free, no obligation estimate for your asbestos removal project. Copyright © 2010 - 2012 aaaleadpropa.com. All rights Reserved.